Exceedingly effective fly trap, prevents flies ever entering your buildings. Ideal for smallholdings, poultry farms, dairies or anywhere plagued by flies every summer. Catches up to 20,000 flies per trap and once trapped they can't escape. 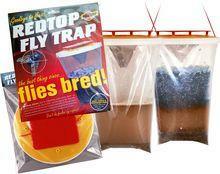 Simply add water to bait and hang the fly trap 10-15 metres away from the area you wish to protect. Non-toxic bait is especially appealing to female flies, thus reducing the next generation and lasts up to 12 weeks.